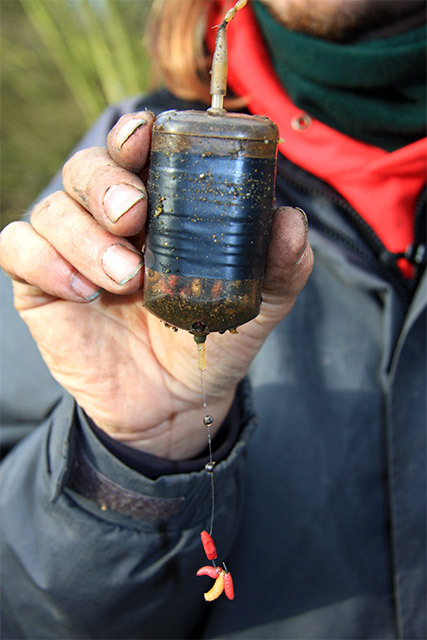 During the winter there is one bait that will usually score when all else fails, and that bait is maggots and plenty of them. Maggots are a great bait not only for chub but also for barbel during the winter. The rig I use is a very simple and one that has caught me lots of fish especially during my time fishing on the Great Ouse. My rig consists of 12lb Supplex mainline with to rubber Float Stops threaded onto the line, followed by a Bolt Rig feeder which has had the tail rubber cut down, followed by two more Float Stops and then finished with either a size 14 or 16 Specialist Barbel hook. The idea is to make the rig as strong as possible and with this rig the only knot is that which you tie the hook on with. On the hook, I like to thread a rubber maggot which I trim down to act as a mag-aligner. This not only helps the hooking properties but it also counteracts the weight of the hook and if all of the real maggots are eaten by small fish the rig is still fishing. With this setup, you can also alter the length of the hooklink by simply sliding the Float Stops up or down. I find that on some days barbel and chub will confidently take a bait close to the feeder, but on some days making it longer can prompt bites. Also, make sure to add a small PVA bag of maggots to kick the hookbait away on the cast. On the hooklink, I like to add No.6 shot to ensure it is hugging the river bed. To start with I will introduce several feeders full of maggot, casting every half hour for the first 3 hours then I will tape up the feeder reducing the feed rate and I will only cast every hour.